The American Trucking Associations’ advance seasonally adjusted (SA) For-Hire Truck Tonnage Index increased 0.3% in November after rising a revised 0.4% in October 2011. 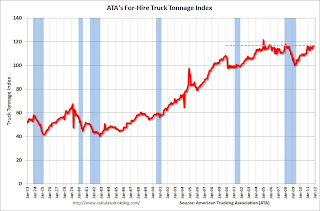 October’s increase was slightly less than the 0.5% gain ATA reported on November 22, 2011. The latest gain put the SA index at 116.6 (2000=100) in November, up from the October level of 116.3. Compared with November 2010, SA tonnage was up 6.0%, the largest year-over-year gain since a 6.5% increase in June 2011. The dashed line is the current level of the index. This index has started increasing again after stalling earlier this year.